Unfortunately, mis-use of pyrethroids has accelerated natural biological processes which means that in some areas resistant mites have developed. There is a simple field test for resistance. As the bees come into contact with the Apistan strip, they pick up a minute amount of tau-fluvalinate – whilst another similar minute quantity emerges from within the strip to take its place on the surface becoming available for other passing bees. Vita has been monitoring the slow spread of mite resistance to pyrethroids for many years. Resistance is an entirely natural phenomenon and there are ways of slowing down its development and even reducing the number of resistant mites so that Apistan can again become effective. An Integrated Pest Management strategy will vary treatment types from season to season and inhibit the development of resistant mites. Apistan and Apiguard are ideal alternating treatments where resistance has not yet become an issue. Researchers have shown that the number of mites resistant to pyrethroids drops rapidly if pyrethroid treatments are stopped. Then after a few seasons pyrethroid treatments can be restarted successfully as part of an alternating IPM treatment regime. There are two tests for resistance, one based on a rule-of-thumb for very rapid testing, the other more rigorous. Place an Apistan strip in a colony. If after 24 hours there is a mite drop rate in the hundreds, Apistan’s active ingredient will be having a sufficient effect to enable its use for that season. Of course you need to be sure that the mite drop is not being removed by bees or other creatures before you retrieve it and the assumption is that your bees have a significant population of varroa in the first place. 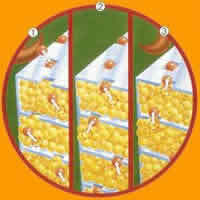 Field resistance test: Around 300 adult bees are collected in a test container, to which an Apistan Package Bee Strip is inserted. After 3 hours the mite mortality is assessed and the presence or absence of resistance can be determined. 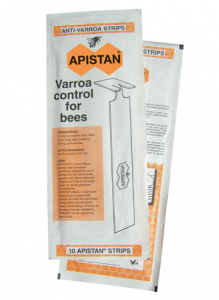 See Apiguard for an alternative treatment / medicine for varroa mites.